Matt here, filling in for Amy. 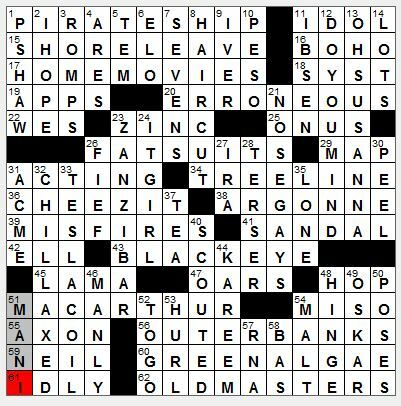 Didn’t receive today’s puzzle until around 10:30 since the Times accidentally uploaded Joel Fagliano’s mini in place of the regular xword. So I solved that amusing grid while I waited. It was a 6×6 grid with black squares in the four corners. Pretty chunky but he filled in nicely, including BREXIT so timely. I blazed through the main puzzle in orderly clockwise fashion. Though 2-D might be I HOPE clued as ([Fingers crossed]) and that turned out be right, since 1-D (“Yeah, right!”) turned out to be PSHAW, then the three longs were PIRATE SHIP, SHORE LEAVE (I guess I should make a “smooth sailing” joke here with those two) and HOME MOVIES. 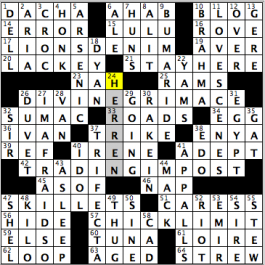 I was not (Wrong) about ERRONEOUS at 20A, which led to the nice DO YOU MIND? and OH, SUSANNA pair on the downs. Finished off the middle-right with the nice entry BLACK EYE clued also nicely with (Boxing ring?). But those question marks are overused — would’ve preferred this clue without it. No warning needed, we’re solving the Saturday NYX! 23-D (Island known for its spices) was driving me nuts with ?A??IB?? — kept trying to make some form of “Caribbean” fit. But when I got the Z on ZINC then ZANZIBAR fell. I dig it when constructors hide marquee entries in the middle of the grid instead of at 1-A. Unexpected Z action, well played. The bottom left was also very nice, with CHILLAXED, nerdy TESLA COIL, and a super-healthy box of CHEEZ-ITs. Try the White Cheddar. And I forgot the nice set on the bottom right; the OUTER BANKS are a very popular destination for beachgoers where I live in Virginia’s Shenandoah Valley. Pretty fun, don’t you think? I don’t remember cringing much and there were a lot of marquee entries of unpredictable lengths popping up all over. 4.30 stars. A fine 70-worder today. Pawel is another constructor whose byline I have seen, but not enough to know his style. I like what I see so far! This wasn’t overly difficult, but there were a couple of clues that I really liked. Nothing longer than 10 letters in the grid, but there are, I believe 12 that length, with four of those interlacing in the middle. To have all of that with smooth entries, we will call this a tour de force! 4.3 stars today! 17A [Degree seekers] CANDIDATES – Or [Presidential office seekers]! 30A [It merged with SAG in 2012] AFTRA – What?? Oh, the American Federation of Television and Radio Artists. If you say so! For some reason, this doesn’t ring a bell at all for me. Still a good entry. 33A [1996 Richard Gere thriller] PRIMAL FEAR – I believe I actually HAVE seen this movie! If I did, it has been a full 20 years or so! 46A [“The Other Side of Oz” autobiographer] EBSEN – Great piece of trivia! According to amazon.com, this is referring to his original casting as the Tin Man in The Wizard of Oz before being fired! 58A [NYC saloon featured in a 2000 film] COYOTE UGLY – Did NOT see this film. Even in the million reshowings on TBS and the like. Another good clue! 12D [Demographers’ concerns] BIRTH RATES – Another good clue. This one stumped me! 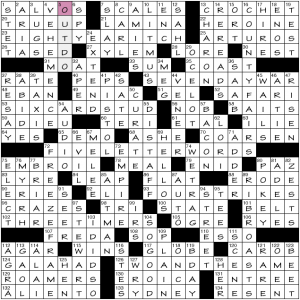 27D [Still runner] MOONSHINER – Best clue of the puzzle! 29D [Detect vulnerability] SMELL BLOOD – Best ENTRY of the puzzle! 36D [Beast of burden] LLAMA – A Learned League reference! OK, maybe not … ! 40D [18th-dynasty Egyptian pharaoh] KING TUT – This was difficult until I figured out it was two words! Awesome Saturday puzzle! Enjoy your weekend!! As Jed Clampett would have said, “Hoo, doggies! !” This puzzle killed me. I honestly thought I would never finish this puzzle! I stared at seas of white squares for what seemed like decades. FINALLY got a toehold near the bottom, slowly inched my way up, and finished near where you see the cursor. If you look closely, you can also see all of the errors I had while solving! I really needed a pain killer after this one! My brain literally hurt! I have been saying for a couple of weeks now we were in for a doozy, and this one lived up to it! Definitely will try more caffeine next week! 4.6 stars for this ultra-challenger! 36A [Quaint dismissal] RUN ALONG NOW – Best entry by far in the puzzle, and that is saying something! 50A [Any of a corporeal quintet] VITAL ORGAN – I didn’t realize only 5 were absolutely necessary. Let’s see: brain, heart, lung, liver, stomach? Nope, instead of stomach it is kidney! I know I PERSONALLY couldn’t live without my stomach! 59A [First African-American to win a lead-actress dramatic Emmy] VIOLA DAVIS – This was actually just recently for How to Get Away With Murder. I must go on a short rant here: I HATE the term African-American! Three reasons: 1) Africa has 54 countries, and not all of them are predominantly black! 2) Nobody ever says European-American; they are German-American or Italian-American because of great-grandpa who came over through Ellis Island, which leads to reason 3) My grandmother did genealogy all the way back to my great great great grandmother, and we never left the United States! If I could trace precisely to a country there, then I would proudly proclaim that! The term “black” is just fine!!! 3D [Staging area of a sort] PRE-OP – This was part of the difficult NW corner! 11D [Lose density] SMARTEN UP – This is how I felt upon finishing this bugger! Smartened up!! 21D [Smashing] DARN GOOD – I thought there might be a stronger adjective in front here! It is only one letter different! 35D [Home of Mascot Cy the Cardinal] IOWA STATE – Whatever! If this isn’t Louisville or Stanford, how are you to know this?? 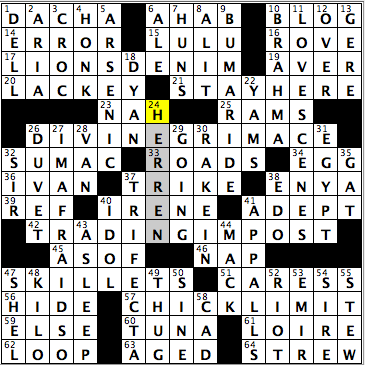 41D [Responded dismissively, in a way] PSHAWED – Toughest entry in the puzzle! Gettable, but who still says this? 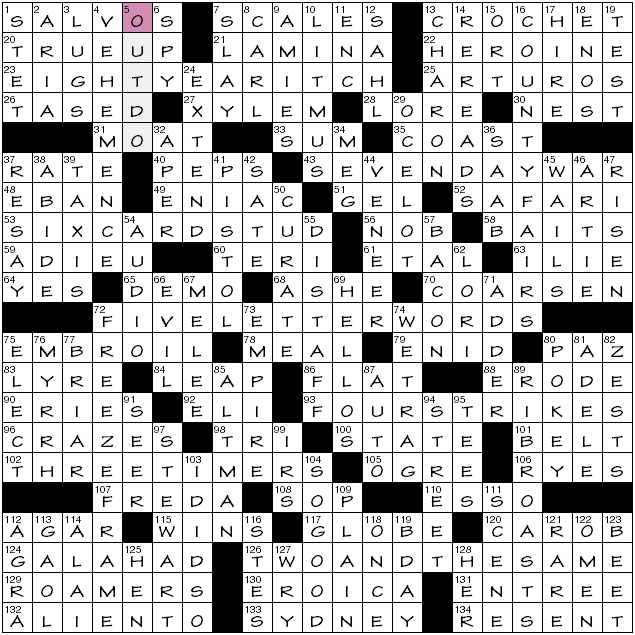 47D [Chunk often cut by a slicer] DIVOT – Best clue of the puzzle! I literally had T-BONE in here at first!!! Off for recovery now! Enjoy your weekend!! Incremental escalation. Each theme answer builds on a phrase involving a number by increasing that number by one. In a spiffy touch, the numbers increase sequentially from the bottom up. 23a. [President’s desire for another term?] EIGHT-YEAR ITCH. 43a. [A full working week?] SEVEN-DAY WAR. 53a. [Poker hunk with an ace up his sleeve?] SIX-CARD STUD. 72a. [Uncontentious expletives?] FIVE-LETTER WORDS. 93a. [Chimes signalling afternoon tea?] FOUR STRIKES. 102a. [Watch, hourglass and sundial?] THREE TIMERS. My favorite themer, even though it sheds a hyphen in translation. Perhaps even in part because of that. 126a. [Identical twins?] TWO AND THE SAME. Not an official revealer: 5d [Surpass] OUTDO. 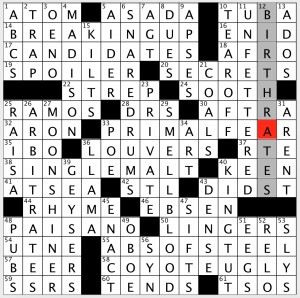 Solved this early this morning, but it seemed there were far more than the typical amount of the resonant clues that I often highlight. Let’s see if that impression holds up. 21a/44d [Thin layer] LAMINA, VENEER. 31a/35a [Water boundary] MOAT, COAST. 79a [“Idylls of the King” lady] ENID, 124a [“Idylls of the King” knight] GALAHAD. Hm, that’s about it for the top-tier, most explicit variety. Pressing on: 65a [Work a trade show booth] DEMO, 87d [Showroom sight] AUTO. 78a [Cook’s creation] MEAL, 131a [Menu choice] ENTRÉE, 123d [Root for the chef] BEET. 89d [Hearty cuts] RIB ROASTS (crossing, by the way, 106a [Hardy grains] RYES), 121d [Red inside, maybe] RARE. 9d [Fille’s friends] AMIES, 116d [Some Fr, honorees] STES. 80d [Big house] POKEY, 113d [Pen for Dickens?] GAOL. Long downs: VEHEMENCE, COUNTY FAIRS, FREEZE FRAME, RIB ROASTS. Which is not to say there aren’t tons of male entries. A greater amount than what’s listed above. 2d [Trilling performance] ARIA. Had no idea he could sing, let alone opera. 66d [Side in a classic battle]. With the initial E in place, I really thought it was EAST. This may be psychologically revealing. EVIL. Also, misread 37a [Borrowing figure] as [Burrowing figure] and was considering MOLE for a long time before realizing the error. RATE. Very enjoyable theme, fluid grid, sufficiently lively cluing. Great crossword. Super-quick review of Ms. Lynn Lempel’s puzzle, which featured theme entries that are nouns which are altered by adding the letters “I’M” added to the entry through puns.. The tune to the rhyme referenced in DELL is in my head, and I’m not so sure now that if it’s a good thing right now (1D: [Home to a farmer who notably takes a wife]). Well, it was either think that, or think of the computer company, and I’ve never owned a Dell. That probably because of the pitchman back 20 years ago who stated, “Dude. You’re getting a Dell.” He always annoyed me! Is this where I’m going to end this blog today? Well, I’M AFRAID SO (27D: “Sorry, but that’s the way it is”]). Just so busy today with traveling (am in Dallas as we speak) and setting up to work for a whole week in the Lone Star State. Will come back with the noise tomorrow! “Sports will make you smarter” moment of the day: LACKEY (20A: [Subservient sort]) – Current Major League Baseball pitcher John LACKEY currently is a member of the Chicago Cubs. Lackey is a two-time World Series champion (2002, 2013) who started – and won – Game 7 while only in his fourth month of Major League service, leading the Anaheim Angels over the San Francisco Giants. That win made him the second person in MLB history to start and win a Game 7 of a World Series. This entry was posted in Daily Puzzles and tagged Bill Zais, Frank Longo, Josh Knapp, Lynn Lempel, Pawel Fludzinski. Bookmark the permalink. NYT: Nice review, Matt… But you forgot that IT GIRL… she who HOPS between the OUTER BANKS and ZANZIBAR, CHILLAXES with the GRANDMASTERS, carries NOSEGAYS and raises one eyebrow at you and says: DO YOU MIND? ZANZIBAR always cracks me up. My son used to love it when I read him Dr. Seuss’ Too Many Daves, and by the time we got to the last one, Zanzibar Buck-Buck McFate, he was just rolling with laughter. I quickly realized it wasn’t good bedtime reading. But I can still recite that poem. PS. I love those Minis by Joel Fagliano. They have a little edgy je ne sais quoi to them. Excellent NYX today–no cringing here either. My only complaint was how quickly it fell–the cluing seemed more straightforward than typical for a Saturday. Enjoyed NYT, although it seemed like there were a lot of puns. I actually think the ? should be used consistently & not doing so is a cheap way to make Saturday more challenging. Why “cheap”? You come up with a nice, tricky piece of wordplay and then tip solvers off to its presence, dampening its effect. Because it seems like it’s applied whenever necessary to raise the difficulty level. If it were done consistently, i.e., the ? tipoff were never used (which I’m not advocating), that would be one thing, but to vary the implementation of the ? simply to goose the puzzle to be in line with a given day’s expectations seems cheap, at least to me. “Chunk often cut by a slicer” has very good misdirection, pointing towards a butcher shop. Does it matter that the answer, DIVOT, is a chunk often cut by a non-slicer as well really matter? 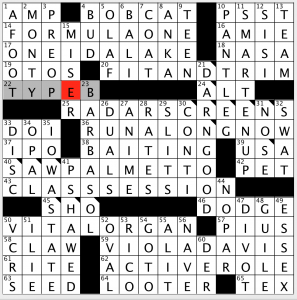 Had the clue been an interrogative, I’m pretty sure I’d have gotten it immediately. Neat puzzle, although very easy for a Sunday. I heartily endorse white cheddar Cheez-its. Why is “war force” ARES? I know he’s the Greek god of bellicosity, but how does that translate to ‘force’? There were two war gods, ARES and ATHENA. Athena represented the intelligence aspect of warring, strategy and tactics. Ares represented the physical force of war. Thanks — that’s a little esoteric! The Outer Banks is (are?) are common beach destination from the DC area, so that was a gimme for me. I didn’t realize Kitty Hawk was on the Outer Banks until we spent a week in OBX about 10 years ago…lots of fun! Slightly OT, but indulge me. I find it frustrating that the WSJ puzzle pdf does not have the publication date. I don’t always solve puzzles the day published. This makes it challenging to know which puzzle is which. Am I alone? You may be able to configure your pdf viewer to stamp the filename—which incorporates the date—on the print-out. As a small header or footer, or some such. Thanks for this suggestion. Will fiddle with it. Adobe Acrobat reader has the functionality you described using what it calls “stamps”. A tad clunky but I can make it do what I need. Thank you for the suggestion. Definitely would be more elegant for the WSJ folks to amend their format, but glad to hear this was doable..
Or, are they descending incrementally from the top down? Chose to frame it in keeping with the theme. That’s my point! Is it a skull or a pretty woman? Derek, I don’t know if I’ll ever understand your evaluation metric for good clues and entries, but I appreciate your relentless positivity. Derek, I don’t know what Cardinals have to do with Iowa State, but they are the Cyclones, so the Cy is somewhat of a hint. What cardinals have to do with Iowa State is that their mascot, “Cy” is a cardinal. Have never understood how they came up with that – I suppose it was too hard to come up with a costume for a cyclone. Guess I should add that Stanford’s nickname is the Cardinal (a color, not a bird). Not sure, but I think this has to do with the movement to do away with Native American nicknames/mascots. I believe Syracuse (Orange) and Dartmouth (Green) fall in that category, too. Don’t know about Dartmouth, but the Syracuse name had to do with the Scots–Irish Orangemen (and by extension Orangewomen). As far as I know it was changed to distance itself from religious affiliation, for simplicity, and maybe to get away from gender-tinged patronization. Something similar, but more simple, happened with the (New York City) St John’s Redmen, which also had nothing to do with Native Americans. After a bit of Googling, it appears that there have been multiple nickname and/or mascot changes at Syracuse. From the 1930’s to the late-1970’s , the official mascot was the Saltine Warrior, a Native American Indian chief based on a hoax story in the school newspaper about the remains of such a chief being discovered buried on campus. It doesn’t seem that “Saltine Warriors” was used as a nickname – at least not officially. In the late-70’s, university administration banned the Saltine Warrior after taking some heat from Native Americans. After a misfire or two, they settled on promoting “Orangemen” (and Orangewomen). Orangemen had been used informally as a nickname, based on uniform colors, dating back to the 1950’s. The switch to just “Orange” occurred in 2004.